Did they make reservations at the hip and trendy Nocturno in Jerusalem, Israel? I hear they have amazing salmon and vegetarian dishes. Maybe the ladies were looking for more of a nightlife feel and kicked back after a hard day of Israel bashing with a drink at Jabotinsky Bar. I must confess that I was jealous of the CODEPINK activists. They got an all-expenses-paid trip to Israel courtesy of their donors. But I’m not sure their financial backers would be too happy to learn that they are aiding and abetting Israel’s economy. But one needn’t look any further than a short walk east of the Western Wall in order to observe a sharp contrast, on the Temple Mount. Controlled by the Waqf, or religious trust, the Islamic religious authority maintains religious, economic, administrative, and some security over the site. As a result, non-Muslim prayer is forbidden on Judaism’s holiest site. While our CODEPINK rabble-rousers were trying to disrupt Jews praying at the Western Wall, a Jewish mother was ejected from the Temple Mount because she had stopped to nurse her crying baby. It is somewhat ironic that a feminist organization ignored the plight of their sister who was simply responding to the needs of her child. They could have been involved in a real fight for human rights if they had taken a five-minute stroll to the Temple Mount. But what fun is fighting against oppression when you can’t blame the Jews? Personally, I look forward to my trips to Washington D.C. every spring to cover the American Israel Public Affairs Committee and Christians United For Israel conferences. CODEPINK always provides the sidewalk entertainment. They always recruit the “I never left Woodstock” crowd or folks who haven’t figured out what to do with their lives since Jerry Garcia died. They hang an anti-Israel sign around their neck and lead them in chants vilifying the Jewish State. And they have so much fun singing along, just like the good old days, sitting around the bong, singing Uncle John’s Band. My only request is that they be given a bar of soap and a day pass to the YMCA less than a mile away. 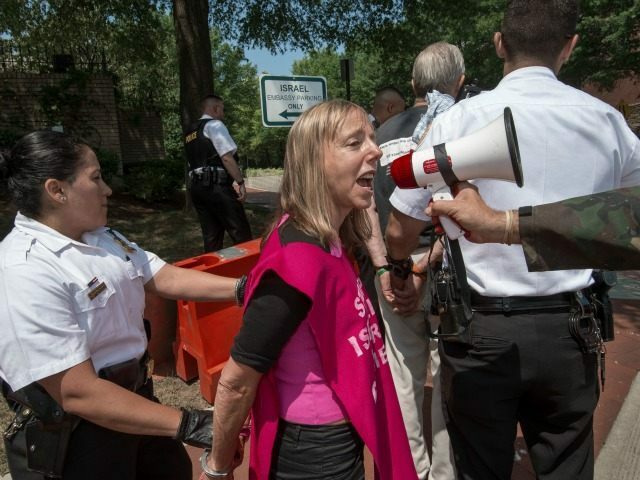 It’s time CODEPINK added environmental concerns to their repertoire. Bradley Martin contributed to this editorial.